Using heat transfer fluid systems without filtration means operating a less than efficient system. Lost production time brought on by unscheduled downtime and increased energy expenditure causes this fall in performance. Though heat transfer fluids are mostly stable when operated below their thermal stability limit and if not contaminated by agents from outside, they degrade over time in temperatures 150°F to 750°F (66°C to 399°C) and oxidize if in contact with atmospheric air. Overheating and contamination makes heat transfer surfaces impenetrable as contaminants deposit and spoil the surface. Sedimentation from solids causes blockage of pipes and valves and burning of heater elements. Choosing the right heat transfer fluid filtration system, therefore, is extremely important. Recommendations are broad with suggestions for side stream percentages to continually filter anywhere from 1% to 20% of the main flow. The industry is in favor of the higher percentages: 10% to 20% of the main flow. More likely the reason being the limited availability of maintenance personnel to change clogged filters. Filtering larger volumes with more filter element surface area result in filters staying unclogged for a longer time before needing changeouts. How contaminated the heat transfer fluid is will also determine the urgency to install a filtration system, and Liquid Process Systems (LPS) offers a fluid analysis at no charge when you purchase a filtration system from us. The higher percentage of contaminants, the quicker you need to clean-up! 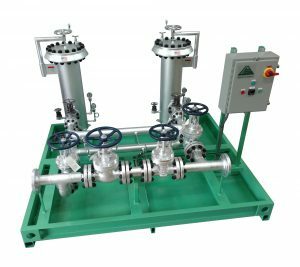 LPS fluid examination provides a benchmark for pre-filtration and also checks if the Acid Number is still within the useful range of “heat transfer fluid life.” Only then will filtration work to extend the useful life of the thermal fluid. 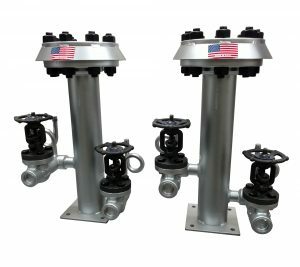 Depending on the total volume of heat transfer oil in the system, the recommended flow rate through the filter housings can flow as small as 5 GPM (24” High) and as large as 200 GPM (65” High). Use our thermal oil filtration systems to filter heat transfer fluids used for indirect heating of processes in industries – plastics, petrochemical, pharmaceutical, fiber, chemical manufacturing and others. Your return on investment could be achieved within 6 to 12 months. A customer of ours realized an immediate saving of $40,000 immediately after installation. He projected annual savings of $22,000 a year from reduced maintenance and from replacing parts. Call us at 704-821-1115 or visit lps-filtration.com for more information.